Cheryl Denise McKinney, 53, passed away on Wednesday, April 10, 2019. Cheryl Denise McKinney was born on December 14, 1965, to Shirly Massey in Charlotte, North Carolina. Cheryl attended Olympic High School and furthered her education at Central Piedmont Community College where she obtained a degree in business. Cheryl accepted Jehovah at the age of 25 and was a member of the Kingdom Hall of Jehovah Witness. For five years, Cheryl was employed by Presbyterian Hospital as a Head Cook. She had the pleasure to work in a position doing what she loved, cooking. Cheryl was a fun loving person who loved her son and family dearly. She spent a lot of time with her son Derrick, teaching him about the Bible and the world. She was a hardworker. She also loved to travel to different countries and learning different languages. Cheryl was often seen in African attire which was her favorite thing to wear. In her leisure, Cheryl enjoyed sewing, cooking, and spending time with her family. 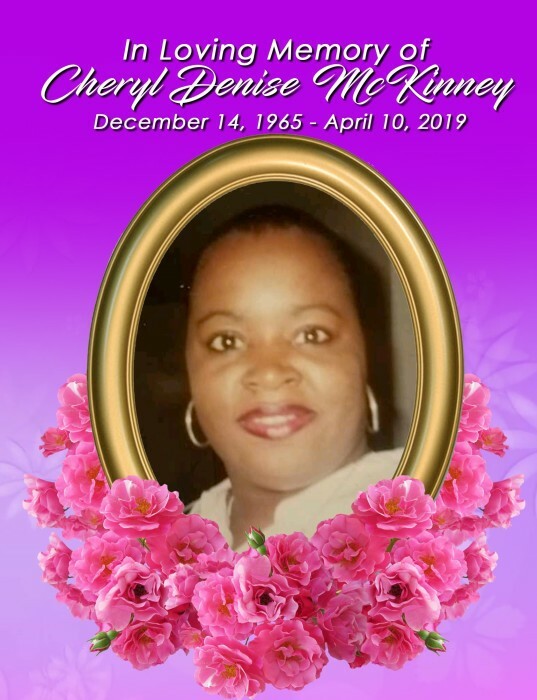 Cheryl Denise McKinney departed this life on April 10, 2019. She is survived by her son, Derrick Edmond, Jr.; granddaughter, LaRyiah RahNae Myrical Edmonds; mother, Shirley Mae Massey; sister, Michelle McKinney-Glover; aunts, Geraldine Hold and Dorothy Field; cousins, Jackie Holt, Mary Hold, Lisa Holt Lamon, Sammuel Holt, Tony Holt, Kevin Holt; Nickey FIeld, Hopey Field, Todd Field; nieces, Satasha McKinney and Brittany Lockhart; nephews, Brian Lockhart, Brandon Lockhart, and Melvin Lockhart; and a host of other loving family and friends. A memorial service for Ms. McKinney will be held at 11:00 AM, Saturday, April 20, 2019, at Boston's Mortuary 4300 Statesville Road, Charlotte, North Carolina 28269. There's still time to send flowers to the Memorial Service at the Boston's Mortuary Chapel at 11:00 AM on April 20, 2019.